Item # 279495 Stash Points: 6,397 (?) This is the number of points you get in The Zumiez Stash for purchasing this item. Stash points are redeemable for exclusive rewards only available to Zumiez Stash members. To redeem your points check out the rewards catalog on thestash.zumiez.com. 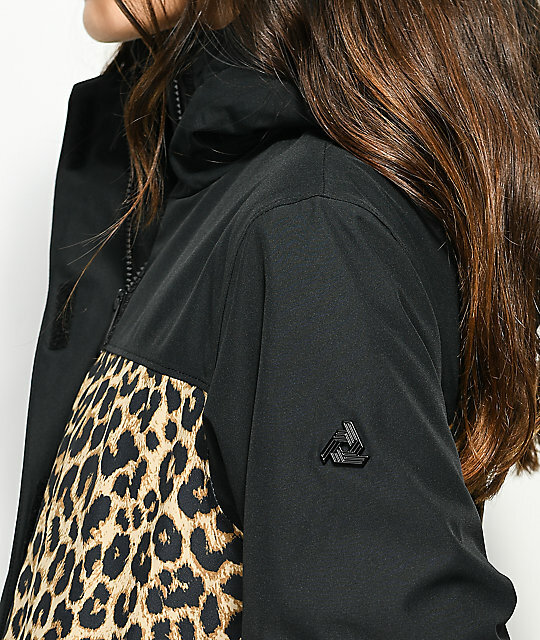 Take your shredding style from drab to fab in the Glisten black and leopard 10K jacket from Aperture. 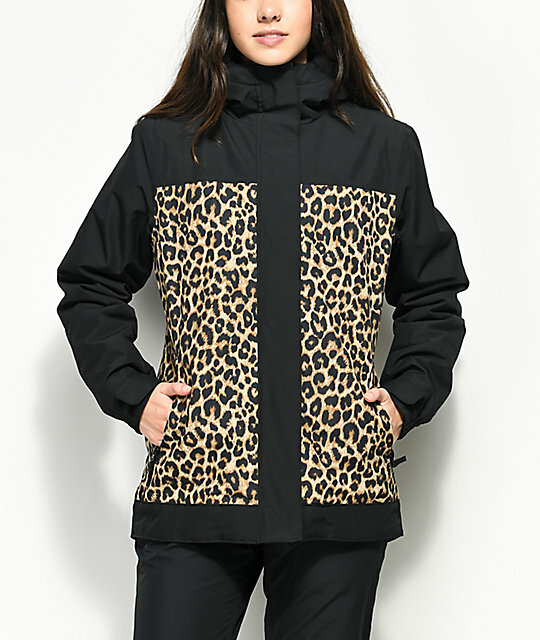 The Glisten Jacket is featured with a leopard body as a contrast to the black sleeves, shoulders and hood while the inside has a supple black tricot lining. Offering a modern fit with tapering at the waist and a slightly curved bottom hem for a flattering streetwear-inspired silhouette. 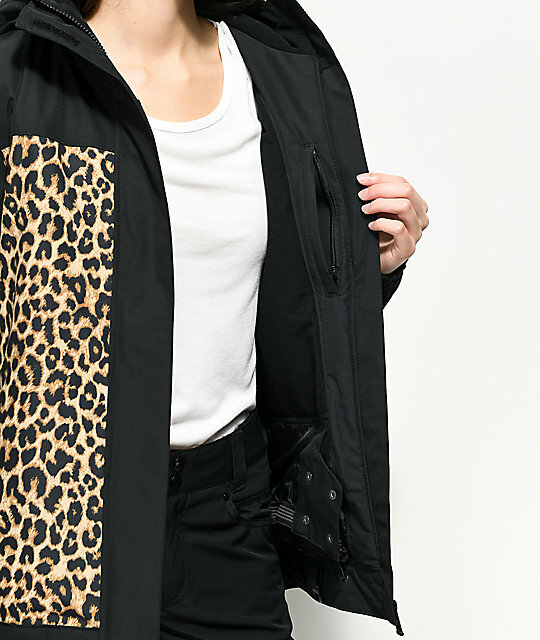 With 10,000mm of waterproofing and a generous amount of synthetic insulation you can ride assured the Glisten Snowboard Jacket from Aperture has your style and comfort needs covered. 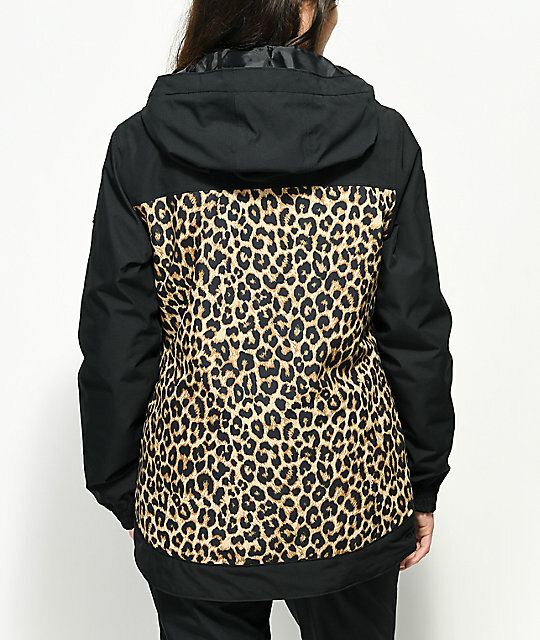 Glisten Black & Leopard Print 10K Jacket from Aperture. Durable & abrasion-resistant 100% polyester outer shell. Waterproof rating 10,000 mm: Moderate water resistance in light to moderate snowfall in cold dry climates or light rain. Polyfill: A warm and soft low-bulk synthetic insulation keeps heat in and cold air out. Tailored Fit: Slim but not tight with slight tapering at the waist for a streetwear parka silhouette with room for layers. Color Scheme: Leopard print body with black sleeves, shoulders and trim. 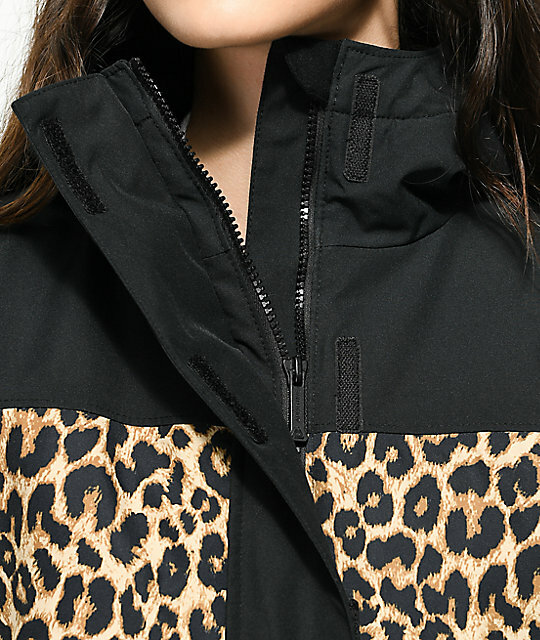 Zip-up front closure w/ hook & loop storm flap. Attached hood w/ hidden adjustable draw cord with locking toggle at the back. Attached stretch powder skirt with snap button tabs to hook to pants. Tricot lined handwarmer pockets w/ zip closure. Black tricot lining for softness and warmth.